I just finished the two dumbest projects ever!!!!! Not because they’re not really nice things, but because they took so long. I think I quilted this quilt 10 years ago. It’s an old Moda Christmas line that included a panel with each letter of the alphabet. I quilted it soon after I got my longarm, which may have been about 2004. I finished stitching the binding this morning. Good grief! How lame is that? So, it’s packed away in the quilt closet, ready for Christmas of 2015. I’m pretty sure I had it on the bed in the bus one year. I guess I used it without the binding being stitched down. My other dumb finish is a sweater for My Hero. The reason it’s dumb is that I think I started it about 8 years ago. I worked on it about a year ago, and then put it away with part of one sleeve left to complete. That’s really dumb! I even had the seaming done on one side before I abandoned it. So I finished it on Saturday while hanging out at my sisters house. It’s a really nice sweater and the neckline finishing is probably some of the best I’ve ever done. The yarn is Debbie Bliss Cotton Denim Aran, and it’s long discontinued. I loved knitting with it though and I love the sweater. I may have to pick up stitches at the bottom and knit ribbed band. It seems like it may be a little short. I’ll have My Hero try it on and then decide. I’m actually home alone for a while today. I’m going to enjoy it by cleaning my kitchen. (That was sarcasm. I don’t really enjoy cleaning anything!) I need some order in my life!!! After that, I’m heading for my sewing room to do a little cleanup before it gets out of control again. And then I may work at finishing up a couple of quilts that are nearly done. And…I have leftover ham, so I think some wild rice soup is on the menu. I’ll be back soon with some weaving that The Genius did, and a finish for me. Categories: Uncategorized | Tags: Debbie Bliss, knitting, Moda Fabric, quilt | Permalink. Thanksgiving weekend was great. I think I’m still recovering from the amount of food prepared and consumed. My parents were here for six days, and Dad cooked several of the nights. He was depressed because we banned him from the kitchen on Thanksgiving Day. Otherwise, we gave him free reign. There were 16 of us around here a lot of the time. We ate, watched football (yuck! ), knit, made puzzles, napped, sang, and ate some more. I’ve stepped it up to a new kind of crazy and decided to knit Christmas lights. I purchased the pattern from kooklacreations on etsy. I’m not sure how many I’ll make yet, because I’m not sure where I’m even going to put them. They just loooked fun to make. And they are! I finally got around to stitching the binding on a beautiful Christmas quilt! The pattern is Vintage Holiday by Camille Roskelly of Thimbleblossoms. You can purchase the pattern here. If you google Vintage Holiday quilt, you’ll see lots of Camille’s signature aqua and red, and a few traditional green and red quilts, but nothing like mine. I used a Hoffman Christmas line but I’m not sure what it was called. I fussy cut a lot of the fabrics. I love the border fabric!!! This chevron block may be my favorite. My goal was to be able to decorate my railing in 30 seconds. I think I succeeded! I was getting frustrated last night, because I feel like I’m not finishing anything. I have knitting, spinning, weaving, and quilting projects going and I want to work on all of them. So instead, I wandered around my house yesterday, cleaning up messes and trying to decide what I want to work on, and not doing any of them. So last night, the girls were cyber Monday shopping and I knit most of a cowl. I finished it this morning. The pattern is Rainbow Twist by Thao Nguyen and it’s a freebie! The yarn is one skein of Malabrigo Rasta. The whole time I was working on it, I was wondering why I was bothering to make it. I didn’t think I’d ever wear it. When I tried it on this morning, I loved it. I think I’ll wear it a lot. It’s so soft and I made it loose enough so I don’t feel like I’m choking. And now for the model shot! In the interest of full disclosure, yes, I did take this in my pjs. And yes, it’s almost noon and I’m still wearing my lovely flannel pajamas. Notice I did put red lipstick on to match! And now it’s time to get dressed and decide which crafty endeavor I’m going to tackle this afternoon. Categories: Uncategorized | Tags: Christmas, Cowl, Hoffman Fabric, knitting, quilt, thimbleblossoms, Vintage Holiday, Vintage Holiday Quilt | Permalink. After three and a half months, the Kid’s World Quilt is complete and is hanging on the wall in its new home. First of all, the back story. I got a call from our pastor in March asking if I’d be interested in making a quilt for a wall in the new kids addition at our church. I immediately said yes. Originally it was going to hang over a stairway. After some discussion between the powers that be that decorated, it was decided it would hang on a two story wall at the front of the building. On March 26th, I headed to Grubers and bought fabric. The next day, I started the quilt. First the grass, and then the sky. The next step was the sun. By the end of April, the tree was added. In May, I started making birds and animals. In June, there were flowers and bugs added. On June 29, the larger of the two quilt pieces was on the quilt machine. It came off the machine at 2 AM on July 4th. The second piece came off the longarm on July 9th. We had a binding party the next week. On July 17th, the quilts were hung. The two pieces together are 12 feet wide and 14 feet 3 inches tall. That’s a two story wall they’re hanging on. This little red guy may be one of my favorites. There were circles in the fabric, so I just quilted around them. Thank you, Mickey Depre, for letting me “borrow” the idea for the ant! My favorite funky flowers. They look a little bit like modern hollyhocks. The idea for the little girl came from Carol’s flickr account. (Check out her blog for some seriously fun stuff!) Then I had to draw the little boy. Have I mentioned that I can’t draw! Who doesn’t love a puppy??? By the last day, I was seriously sick of machine quilting. If you’ve followed my blog for a while, you know that I have a hate-hate relationship with my longarm quilting machine. The very last thing I quilted were the rays of the sun. Well, waddayaknow!!!!! There are feathers on those sun rays. I actually did it. This project has stretched me far beyond what I thought I could ever do. Transferring an idea from my head to fabric was a long, sometimes scary project. I’m beyond thrilled with the results. While this quilt won’t change a little child, the whole kids building and the people who work there will. There are so many people there that will love on those little kids. They’ll be Jesus with skin on. And that’s why I made a ginormous quilt. Categories: Uncategorized | Tags: art quilt, children, ginormous, Kids World, longarm, quilt | Permalink. First of all, I think it may be done snowing here. Finally. Second…..the ginormous quilt base is finished! (For the story of the quilt, read this post!) The sky is pieced! This is only 2/3 of it. I was shoving furniture out of the way to try to lay it out, and I still only had room for part of it. Now it’s time to start decorating it! First up, the sun! Excuse the pun! Although it’s really fun! Ok. I’ll quit! Excuse the cruddy iphone photo. The blue fabrics blend so much better than this shows. And the orange isn’t nearly as glaring. I fell into the paper piecing hole again. That always slows me way down, but it’s so worth it. I’m starting to worry a bit about how I’m going to fill this quilt. It’s massive!!! This is only 1/3 of the top and the three feet of grass at the bottom isn’t attached either. I’m taking the whole thing over to My Hero’s office next week to lay it out and attach the grass to the bottom. I recruited a lady from our church to sketch out the tree that will fill the left side and top of the quilt. The scale needs to be right, and I can’t draw to save my life. I have various critters and flowers to add to the quilt. Figuring out the size of the flowers will be my project for next week. Everything seems to take twice as long as I thought it would. I figured I could pound out the sun in a day, and it took me two days instead. And now it’s bed time. I’m quilt retreating the next couple of days. I think I’m working on my Sue Spargo stitchery. It’s portable, and I’ve spent enough time with my sewing machine the last few days. I think there may be some knitting and spinning as well. Categories: Uncategorized | Tags: applique, Kids World, quilt, sun | Permalink. The grass is green….in the house. There’s still snow all over outside. If you’re trying to figure out what I’m up to, this post explains it for you. The bottom of the quilt is all the dark green blocks. You’re looking at it from the side. I first made crazy log cabin blocks, and then decided to do the paper piecing along the whole edge. That was a huge slice of crazy pie! I took newspaper paper (is that what that stuff is called?) and drew out the curve and then drew in all the pieces. Then is was just a matter of sewing them….one piece at a time. On the bottom of the photo, you see what I have done all rolled up and pinned to keep the roll intact. This piece was 12 feet wide. Then I tore off all the paper….one piece at a time. I trimmed the edges up and applied 1/4 inch wonder under to the edges, just to anchor it until I can quilt the tar out of it! Then I pinned it onto the quilt base and ironed it on. It just has a row of stitching along the edge for now. The machine quilting will hold it down til Jesus comes!!! The first piece curved down and is in the middle of the grass. Then I created a hill above it and did another six feet of paper piecing. The paper piecing was a lot of work, but I think it will be totally worth it! And strangely enough, I want to make this now! The next step is to do the top 12 feet of the quilt. It’s all going to be sky. Six colors of sky! I’ve done all the math and I’m ready to set up a cutting rotation and go at it! After the sky is finished, I basically have a 12 X 15 quilt. It will be a relatively blank canvas. Then it’s time to start playing. Trees, birds, flowers, sun, a giraffe, and maybe even a hedgehog. I have lots of ideas swimming around in my head. I’ll leave you with a photo of my assistant. She’s been zero help! Somehow I ended up with two dog beds in my sewing room, and her biggest problem is deciding which one to sleep in. I’m so looking forward to the weekend. Its been a busy week and I’m looking forward to doing a bit of what the dog does all week! There will be sewing, knitting, and spinning. The laundry room will be emptied out! It’s piled high but everything is clean and folded! And….we can finally get at the grill without climbing over a snowbank! Categories: Uncategorized | Tags: Kids World, paper piecing, quilt | Permalink. Here’s an update on the ginormous quilt I’m making. 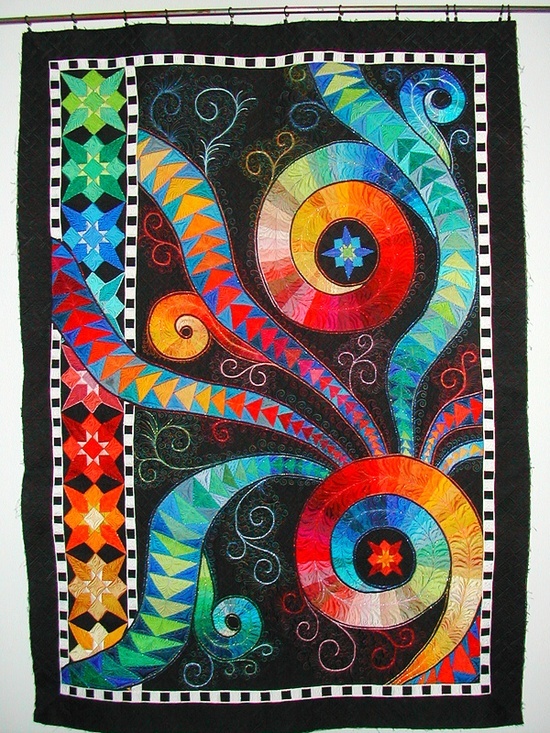 If you missed the info on this quilt, just go back one post! I have 12 feet of grass completed! I started working on the blocks yesterday and ran out of fabric. I purchased all that fabric and ran out on the first day. Yikes! So my aunt and I headed to Gathering Friends Quilt Shop. I picked up two more greens and headed home to sew. The next step in the process is to sew these rows together. Then the fun begins. There is newspaper paper involved. And some drawing. Lets just say the grass isn’t going to be three straight, long rows. It needs to have some curves and I’m adding a hill. Do you want another clue? I’m using this photo for inspiration! I discovered this photo while searching for ideas for this quilt. I found it on this web site. Aren’t her quilts beautiful? Now I bet you’re really wondering what this has to do with grass!!! You’ll just have to wait and see. If you’d like to see a compilation of some of the ideas I’m collecting, take a look at my Kids World board on Pinterest. The next thing after that is to figure out how to do the gradient of the sky. I think I have six shades of blue/turquoise to work with. But first, back to the grassy knolls!!! This is kind of like watching grass grow, huh??? Categories: Uncategorized | Tags: grass, Kids World, quilt | Permalink.